CMI Fleet Team Awarded #1 Fleet Team! Congratulations to the CMI Fleet Team who were recently awarded the No. 1 Fleet Team in the Central Region for 2017! 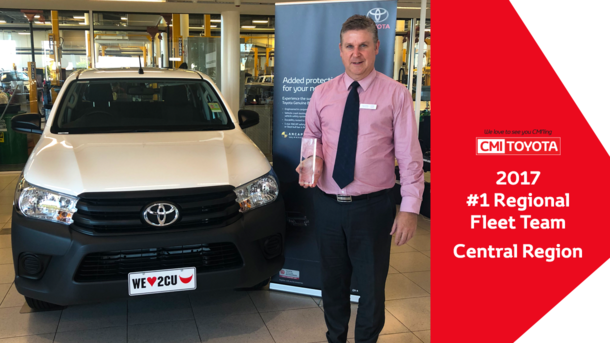 CMI Toyota were recognised as the highest volume Toyota Fleet Dealer in South Australia and 2nd largest nationally for 2017. This award has cemented our position as experts in the whole of life costs of fleet management. We wish to thank all our fleet clients for entrusting the CMI Toyota Fleet Team to service and manage their Toyota fleet requirements. We believe that our success is built from our dedication to provide the best fleet outcomes for our clients via genuine fleet management and by supporting our clients with all their fleet vehicle needs. The CMI Toyota Fleet Team have a dedicated, professional and experienced team including a Fleet Sales Manager, 7 Fleet Account Managers, Fleet Business Manager, Fleet Stock Controller and Fleet Administrator. CMI Toyota proudly stock the largest range of Toyota vehicles in South Australia and specialise in commercial vehicle fit outs for all applications including Mining, Agriculture, Infrastructure & Construction, Refrigeration and speciality builds to suit any specific fleet requirement.